It’s not the prettiest reservoir, the Logan resident said. Compared to other bodies of water, it is relatively shallow and the current is slow, making it easy for sediments to build and cloud the water. One reason for the reservoir’s aesthetic woes is eutrophication, a condition that occurs when a body of water has high levels of nutrients like nitrogen and phosphorus, causing increased algae growth. Algae can in turn contribute to murky water, said Christiansen, a senior at Utah State University studying engineering. “It changes your ecosystem substantially to have water that cloudy,” Christiansen said. Too much algae in a river or lake can limit plant growth by blocking sunlight, he said. In many spots, the bottom of the Bear River and Cutler Reservoir lack mosses and other plants, he added. To illustrate, Christiansen compared the Bear River to a pond he had in his back yard as a child. It’s easy to put nutrients like phosphorus into a body of water, but hard to take it out. Runoff carries nutrient-rich fertilizer into streams and rivers, and most wastewater treatment plants discharge water with high phosphorus levels. Christiansen is part of an effort by the city of Logan and Utah State University to help reduce phosphorus in water by cultivating algae in the city’s wastewater treatment plant and turning it into fuel for vehicles. Unlike many areas downstream, the 460-acre treatment lagoons aren’t meant to be a habitat for plants or fish, said Issa Hamud, director of Logan’s Environmental Department. “The idea is to grow algae in the lagoons and harvest it before it’s discharged, then take that algae and produce biofuel out of it,” Hamud said. The algae acts like a phosphorus sponge; since the single-cell plants incorporate phosphorus in their structure, taking algae out of the water takes out the nutrients as well. The city has a financial motive to clean the plant’s discharge, too. The Utah Department of Environmental Quality recently designated phosphorus as a water pollutant, Hamud said, and Logan is under mandate to reduce the phosphorus in the water discharged from the plant by 60-65 percent by 2016. Building a mechanical treatment plant to remove phosphorus could cost $80-$200 million, he said. USU partnered with Logan to grow algae for economical as well as environmental reasons. As the price of oil rises, the U.S. government is spending billions to develop alternative fuel sources. Algae is an appealing source for biofuel, holding a few advantages over corn and soy, said Byard Wood, head of USU’s mechanical and aerospace engineering department. Though turning algae into fuel would have many benefits -– removing phosphorus from lakes and rivers, reducing energy costs and carbon emissions, to name a few –- engineers are still trying to work around some roadblocks in the technology. The algae must be grown in high concentration, extracted, dried and converted to biofuel, Wood said. 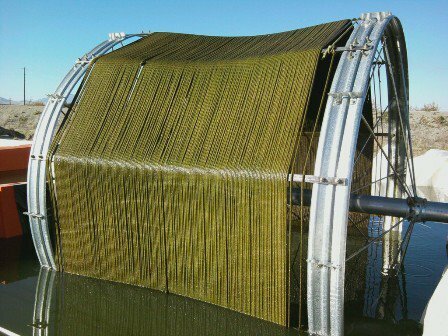 Unlike corn or soy, which produce biofuel at the expense of farmland that could be used for food production, algae grows best in water. Logan already has an ideal place to grow algae, Hamud said. Researchers at the university are finding ways to grow algae in denser forms, making it easier to harvest, Wood said. Immediately after harvesting, however, algae will still be 85-90 percent water. Unless algae is dried within six hours of harvesting, it starts to lose its use as a fuel source, said Steve Hansen, a research associate professor in USU’s mechanical engineering department. Drying the algae has been a major roadblock to engineers. Conventional methods using propane or electricity would spend more energy than the biofuel is worth. No one has discovered an efficient solution, Hansen said. “If we can’t dry the algae, we can’t get the fuel out,” he said. Hansen presented the problem to a group of six of his mechanical engineering students, including Christiansen. As part of Hansen’s capstone design class, the group’s assignment is to design and build a solar-powered prototype capable of producing 5 kg of dried algae per day. If the prototype is successful, engineers can work on larger models. Christiansen said the team just finished the design phase of the solar drier and hopes to build it by the end of the year. The goal of drying algae with little or no electricity looks achievable, he said. The drier converts sunlight to thermal energy, which is a much more efficient process than converting sunlight to electricity, he said. The treatment plant can produce around 15 tons of algae per day in the summer, Christiansen said, and if all of it could be harvested, it could make as much as 750 gallons of biodiesel. “That’s a pretty hefty chunk, I would think, of what the city spends per day on gas for their vehicles,” Christiansen said. “But when you compare it to the population, that’s a drop in the bucket. Though algae won’t solve the world’s energy problems on its own, Christiansen said it’s a step in the right direction. Compared to coal or other fossil fuels, algae is carbon-neutral: carbon is released when algae is burned, but the algae originally extracted that carbon from the environment, Christiansen said. Burning the leftover biomass produces ash, which can be used in fertilizer and other products, Christiansen said. If engineers at USU prove that wastewater can be turned into biodiesel, the effect could be global, Hansen said. In the meantime, if engineers in Logan can use algae to extract phosphorus from the wastewater plant, it may nudge Cutler Reservoir and the Bear River toward a clearer future.